For recent testimonials, please visit our Facebook page where customers continue to post success stories. 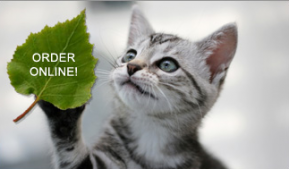 Thanks for caring about cats and birds! Dear Cat Goods, our 8-year-old Tuxedo cat Mooch killed birds with chilling efficiency until we discovered CatBibs. We now have no bird kills when he wears his CatBib. The Bib alters his gait but does not hinder his ability to climb into and out of trees. 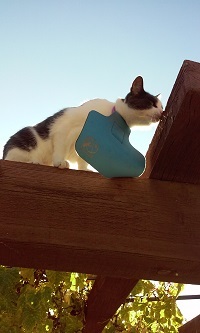 An added note: Mooch escaped his first CatBib when the Bib was attached to a collar with a quick-release clasp. 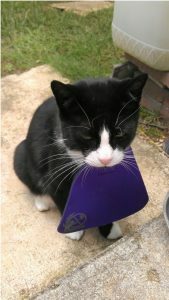 We found the Bib and collar in his hiding place and reattached the Bib to the stretch-release collar sold by Cat Goods. 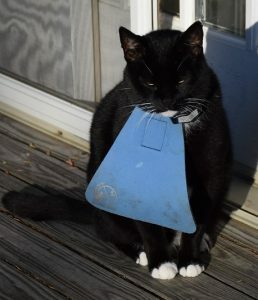 Mooch has not escaped from his CatBib ever since. We have several CatBibs that we alternate as one gets dirty, and simply wash them in a dilute soap solution, rinse in water and hang them to dry. Harry is a super-predator. Chipmunks are his prey of choice and I have great affection for these little squirrels. I have tried a lot of things to keep Harry from killing them; invisible fence with collar set to “Doberman,” pepper-based materials on the ground, rose canes in the paths and many stern talks. After I purchased Catbib, Harry’s murder spree stopped. On a dime. However, Harry almost had the last word. 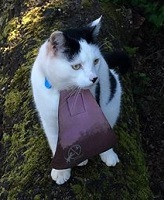 I had put his Catbib on my own release-type collar. I left Harry outside when I went shopping and when I returned, Harry had ditched the collar and bib. Everyone in the house looked for the bib an collar for over a week and finally found it. Harry had buried his bib in the garden. Completely covered it up. What better testimonial could you possibly get? 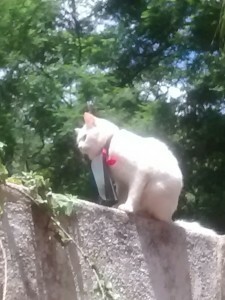 He is wearing it again with one of your collars. Poor Harry. Foiled again! Thanks for a life-saving product that Harry just hates! Dear Catbib Team, This is Mushki! He is a bird catcher extraordinaire (It probably comes from his wild Siberain ancestry)! Our neighbors have the most beautiful white doves living in their yard and Mushki has taken out two of them not to mention all the poor birds in our own garden. I searched the internet high and low for a solution and finally found the catbib. Even though we live in South Africa I ordered it immediately and the shipping costs were well worth it! Mushki had no problem putting on his bib and doesn’t even seem to notice it. I am very glad to report that he has only caught one bird in the last two weeks where previously he was on two a day!! He is also much more visible to traffic around the house and I was able to write all my contact details in permanent marker on the back of his bib. Thanks for a great non invasive solution team! 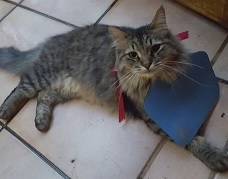 Since wearing the cat bib consistently, our big hunter, Soleil has now ceased bringing me the victims of his hunting forays. In the past, he caught approximately one hummingbird per day, along with snakes and alligator lizards. For a while after starting to wear the large bib, he would still bring a live catch in occasionally, but now he has stopped completely. Even though he is really strong and an excellent hunter, the smaller bib yields better results. I am SO happy to have found something as effective as this to stop the killing. He would not thrive as a 100% indoor cat. He needs a little time each day outdoors. Thank you so much for creating the cat bib. 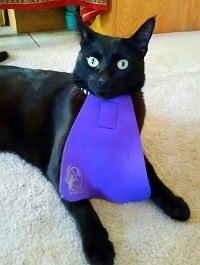 EVERY OUTDOOR CAT SHOULD WEAR ONE! I had actually started checking out how to take our cat to the animal shelter because she was killing so many birds. Keeping this young stray we adopted in the house all the time wasn’t an option. We have a large lot that is very bird friendly. She was killing everything from Hummingbirds to Jays and Thrashers. I was actually getting ill every time I had to dispose of a dead bird. I decided to check the internet to see if there was any solution when I found the Cat Bib information. The day before I put the large bib on her she had killed two birds that we knew of. Since then she has gotten one in over two weeks. This was a very young Towhee she managed to snag under a shrub. So, the bib works. She seems able to do just about everything she does without it, including climbing up the lattice work to the top of the grape arbor (see photo). 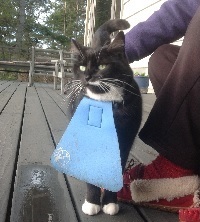 We figure this Cat Bib has saved our cat from the shelter and also saved a whole lot of birds. Our one complaint is that it is too easy to loose. We got a collar with elastic instead of the quick release and she still managed to get out of it. Luckily, our neighbors and I have found them. Aware of the increasing detrimental impact that both feral and domesticated cats have on wildlife, I felt a huge sense of guilt every time Katz brought home a scared, maimed or dead animal. I tried keeping him indoors during prime time bird and animal activity, but I could not consistently keep to this schedule. Thus Katz always managed to catch something more often than I would like. 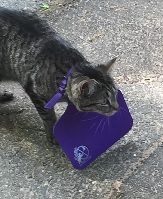 Now, with the CatBib, I can allow Katz greater freedom to use his cat door and roam his territory without the worry of discovering another furry creature in my bedroom closet! Thanks Cat Bib! (I hope the National Audubon Society will endorse and promote the use of this product). Here’s my rescue cat named Mo. He used to be a terror for the birds in my yard. He was a mighty hunter until the bib. They are no longer in danger! Hi! Just wanted to let you know how effective our CatBib has been. Here is Scut Farkus wearing his. He was someones idea of dealing with an unwanted cat, aka taken out into the country and dumped. We took him in, had him neutered, etc. He turned out to be quite a good hunter of wildlife. His CatBib has saved ALOT of little creatures. A very effective product. Thanks so much! I am so glad I found these on the Internet. My two female cats were on a killing fest and bringing live chipmunks into the house. I decided to keep them in but they were very depressed. I thought there had to be something out there. I got two large bibs and the cats are so happy to go out they are tolerating them well. No more daily killings. Thank you. In the approximate 2 months that our kitty has been wearing the bib the bird death toll has reduced from 3 birds or more a week. It is a roaring success and I am so glad that I ordered it. Now I can relax and stop stressing the neighbors will poison her or something as they are avid birders. 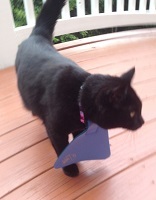 As soon as we attach her bib, she calmly walks out on the deck. It is delightful to have her be so accepting of the collar and bib. She can groom herself, eat, snooze and accept pets all the while wearing the bib. 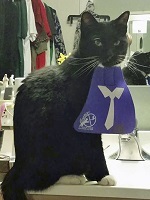 This ease of use as well as its effectiveness have made us promoters of the cat bib. Our two year old male, will soon get his collar and bib. We have put our phone number on the back of the bib, so it works as identification also. Hi, this is Hammie wearing his bib. We have bird feeders and I have found, sadly, dead birds the two times I accidentally let him out without the bib. With the bib, he can’t get them. It really works! Well the Cat Bib arrived safely to Zimbabwe and seems to be doing the job on protecting the Wildlife there!! And its Not bothering Albie at all. My other sister wants one so she will be in touch. Wow! This product is a life saver. Our cat Jarvis was regularly catching birds with brutal efficiency. Trying to keep him inside made both him and us miserable. 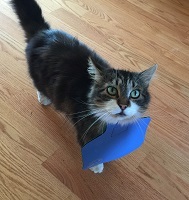 We ordered him a cat bib and despite his small size a large bib was needed because as the website says the bib size should be proportional to the hunting ability not the size of the cat. It took him no more than 5 minutes to get used to wearing it and now he patiently waits by the door to have the bib put on before going out. In 3+ months I think he’s killed as many birds as he would easily catch in one day. This inexpensive product (and cheers to the company for keeping prices and shipping costs so low!) has literally saved tens if not a hundred birds! The collars they sell are wonderful too. Well worth the price.Thank you, cat bib people, for making this fantastic product that saves wildlife and still allows my cat to be content. That equals a VERY happy customer!